Day 2 Turkey: Pamukkale the Cotton Castle. 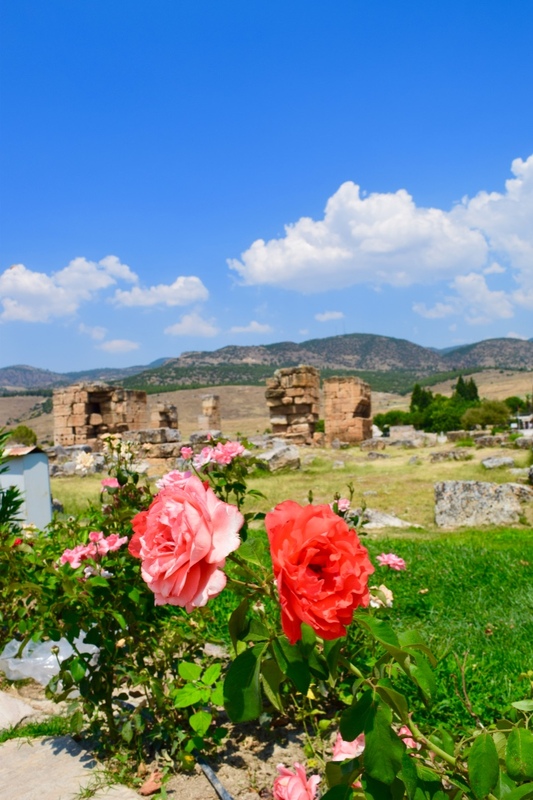 So many amazing old ruins with a great backdrop of roses. Sleeping past my alarm, fortunately my brain woke me up at 6.25am. Can you set your mind to wake you up? It is a skill I realise I have, and for me I normally wake before my alarm by a few minutes, on this morning I was off by 15, still not bad. I had stayed up past 1am reading this awesome new book I picked up in Munich airport, more on that another time. I rushed around and hurriedly prepared myself for my big day out to Pammakule. Soon I was on the mini bus and we were driving out of the quiet streets of Antalya. With the air con on, sounds of ’80s pop blaring from the radio, my driver Mustafa put the pedal to the metal, zooming and zipping our way through the city for our full day escape. After a sesame bagel and delicious sweet apple tea at our first stop, we were soon in the countryside. I always love to get out of the cities when I travel, the beauty of a country can be found in the countryside I believe. As George Michael entertained me with his soothing melodies, we passed through high undulating mountains full of marble, and low lying scrub with not an animal in sight. Maybe it was too hot for them? Even though I could not see them, my guide reassured me that in fact there were an abundance of wild pigs, sleeps and goats. I was surprised to see really high mountains appearing all around us, up to 5000m high, full of precious white marble, impressive! Marble was so expensive in Australia, I was surprised to see it in such abundance here in Turkey. Marble in fact was one of the main export products of Turkey, mainly distributed to Italy, America Germany and other parts of Europe. Fruit and vegetables were also a big export, and surprisingly 80% of what was grown in the country was exported. Cherries, oranges, bananas, apples, tomatoes, cucumbers and olives are some examples. 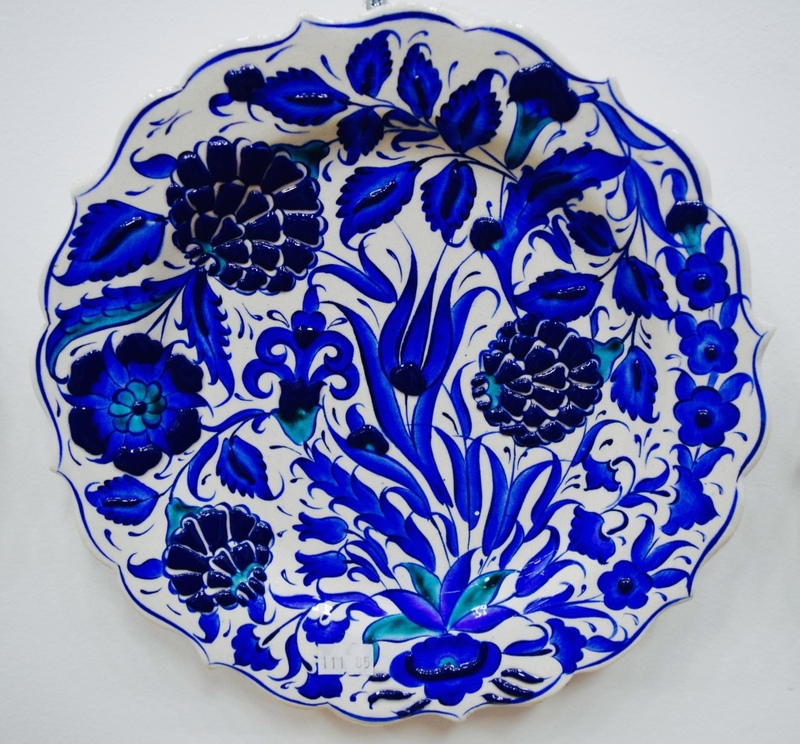 We stopped in at a ceramics place and saw these bright blue plates of joy. Temperatures get high here in summer, up to 50 degrees in the full sun on the mountainside. Crickey! Now that is hot! As I sang Stevie Wonder songs we continued to bump along the road. It was nice to sing the words “I love you” out loud, to the amusement of my bus driver. I didn’t care, it was fun! The Japanese girl beside me was already nodding off, tilted at a 45 degree angle. I have always been impressed by the ability of anyone who can sleep on demand in a moving vehicle like that. Good on them! I was happy to see the scenery and write. Give your close ones a call and tell them you love them. It is so important to say the words, so many people neglect to share these simple three words which can make all the difference in life. Do it for me because I cannot call my two most loved people any more. I still tell them every day though, love you Mum and Dad. As Whitney Houston belted out “I will always love you” on the car radio, it was time to drive back to Antalya. Pamukkale had been amazing. 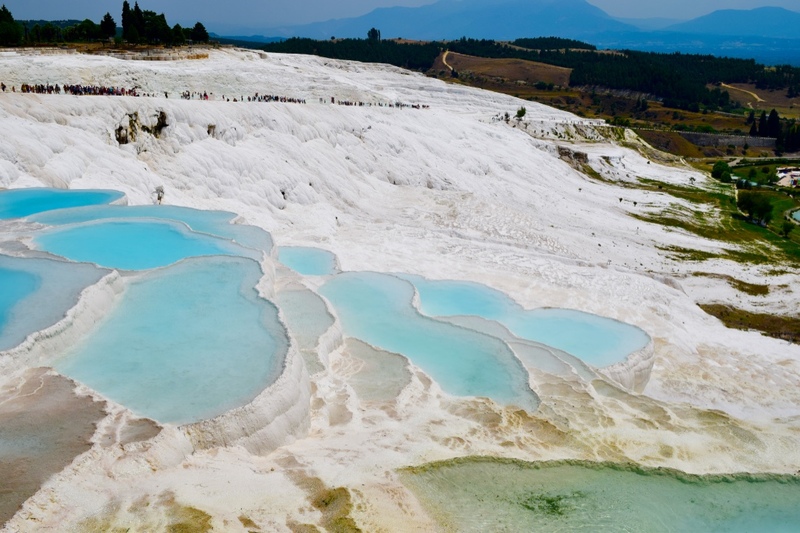 Bright blue pool in a calcium carbonate white rock setting, a real marvel to see. I was also really impressed by the huge array of ruins in the area too. I tried to imagine how they would have looked hundreds of of years ago, it was difficult to imagine a civilisation had thrived there so successfully in such opulence. The day had been really hot, 46 degrees in the sun, and still quite sweltering in the shade. I chose to avoid the crowds and swim in the ancient pools instead, for a fee. The ancient pool water was warm, not so refreshing, and with bits of green mouldy stuff, it did not look or smell that clean. The water was clear, with what looked like chunks of limestone or marble rocks under foot. The pool was an old ruin in itself, people would come from far and wide years ago, for a healing in the elixir. Many also died, the water failing them, apparently there was also a big grave yard full of the sick hopefuls. Well I just thought it was hot and smelly! So out quickly I hopped, and into the cooler shower. I was tired, hot, and perhaps dealing with a bit of mild sun stroke. The cure I needed was a rest, a cool drink and to get my sunburnt shoulders out of the sun. Flowers in amongst ruins. Simply amazing! Turkish people sure do drive funny. I have never seen anything like it. My driver seemed to keep the car on cruise control, at 100km per hour, permanently. And then would ride the brake, pumping it periodically, and not nearly enough for my liking as we careened at twice the recommended speed. Those brake pads sure must wear out fast! It seems talking on the phone while driving, and perilously flying down a mountainside dodging cars, is also acceptable. As I sat in the passenger side I pumped my pretend brake with my right foot upright into the car mat; wishing I could slow the van down myself. I failed. But I sure could write about it, this calmed my control freak personality. This is what the countryside looked like as we drove back to Antalya. Overall the day was awesome, I highly recommend heading out to Pamukkale. Sadly the ‘Cotton Castle’ sees an influx of 5000 tourists daily, so it is hard to avoid throngs of people. The ruins were quieter though which was nice, and I managed to get some good, people free photos. 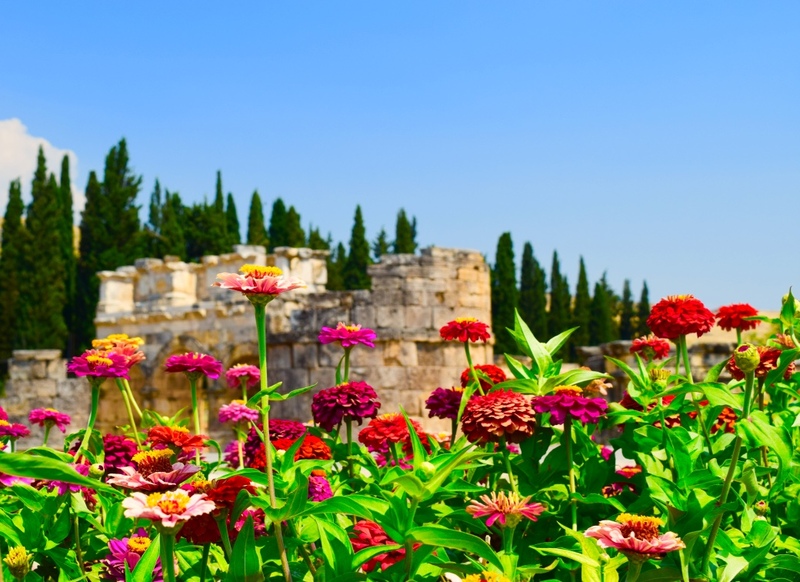 My guide group was excellent and I can highly recommend Antalya four seasons travel. Make sure you travel on a smaller mini bus, as it is a faster and more personal experience. Do not get caught up in the trap of the big bus load experience, not very fun. 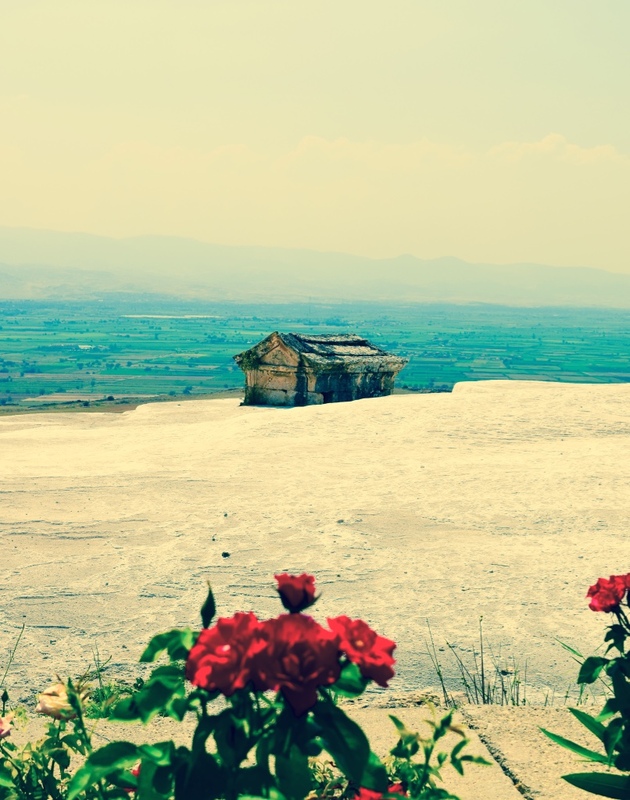 I hope you have enjoyed my account of Pamukkale, what is your favourite place to visit in Turkey? Really enjoyed this post – you have a talent for travel writing I think! Thanks so much!! I really appreciate your feedback 🙂 If only I could get paid to do it! It is possible I know… I will keep writing for the love of it! Thanks again, I hope you enjoy my other posts too. You’re welcome – I love good travel writing! ← A Good Ending to a Bad Morning.